My 2010 “Western States/Badwater Dreaming” season kicked off last Saturday in a pretty good fashion. I’d been nailing down some good hill work and speedwork (and eating) with the Creative Citizen crew, and was looking forward to the race. A group of coyotes were invited out to Texas to help our Moeben Momma, Shannon celebrate her 500 mile jacket. 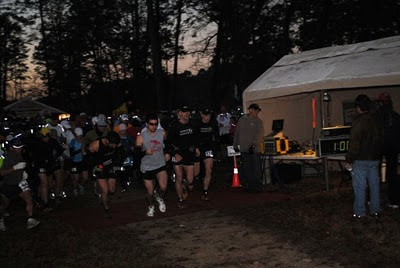 Before I had even seen the course, I was having to remind myself constantly that the 50 mile race was more important in order to gear up correctly for my AR50 and Miwok aspirations.. When we got to walk a half mile on the course the day before, I had an even harder time trying to convince myself not to do the 100. Though most of my counterparts in the 100 tripped over a decent amount of roots, rocks, and winding trail, I found the course quite inviting. The way the trail winded and pitched you along through gradual short climbs and descents with a sprinkling of slightly technical areas kept my form up, my mind focused, and my chest forward. I think there were two ways to run: leaning forward and agressive, or on your heals and cautious.. Since I was in the shorter race and rocking the MT 100's the agressive style kept me running fast and helped me to avoid tripping on roots as I flew along.. However the later style was taxing on the 100 mile runners, and it eventually wore out their focus as Jimmy fell 7 times, and Shannon fell so hard she broke/sprained her finger (though she did finish though to earn her 500 mile jacket). Since the course was an overlapping loop course, there was a lot of passing and greeting as you met other runners passing them in the opposite way or overtaking them. I lapped roughly 2/3rd’s of the 50 mile field, as well as most of the 100 mile field a few times, so the course became a little bit more technical. As the day went on, I went from making eye contact and smiling to focusing on the ground and greeting runners with muffled “good job's" or “on your left's". However all in all, running with so many people on the trail was motivational, and the extra work didn't bother me too much. A fast road runner had come out and was doing high knee jumps before the race. Peter and I looked over at him wondering what he could possibly run for the race, as he was starting the race without carrying any water. We reviewed my strategy and agreed to stay within 5 minutes striking distance, but still run my own race for the first 2 of 3 laps. The gun went off, and the road runner and I took off charging down the quick single track. I let him go after about 10 minutes, and he was a minute ahead of me as I cruised through the first aid station in at 3.1 miles in just over 20 minutes. I was excited, but in control as I experienced the entire course for the first time. I caught the 100 mile runners in about 30 minutes, and began a long day of dancing along the sides of the singletrack avoiding two-way collisions. Coming out onto the park road around mile 10, I realized that I had worked the more technical single track earlier in the loop too hard, and was lacking power on the fire road that I should have been running faster. I made a mental note to check my speed on the second lap and focus on the consistent fire road. As I passed Jimmy, Jamil, and Nick, Jamil told me the lead runner was a few hours ahead, and the sarcasm helped me to realize I needed to settle into my pace. Jimmy also promised that the road runner without a bottle was going to “fade like a k-mart beach towel” and put my mind at ease about catching him later. As I came into the end of the first lap, I saw the leader at 1:56, and calculated a 6minute lead once I came in. Peter confirmed this, and asked me about my salt and gu. I had only had 1 in the first 2 hours, and downed one as I came into the aid station. Kate scolded me about not eating enough, and I listened eating more the second loop. However the low Gu and salt intake on the first loop weren’t too bad as I was peeing a lot and clearing up indigestion. The crew had me out in just under 2 minutes, and I was ready to take on loop 2. On my way back out I greeted the other 50 mile runners in chase, and found a large amount were still within 5-10 minutes of me. Seeing this, I pushed ahead with my race plan to stay in control and then run the second half of my 2nd lap my the strongest, using it as the most opportune time to put distance on the field. I was worried that more of them may have paced themselves their first lap, and were ready to strike at the start of the second, but I just kept running along and never was overtaken. I couldn’t tell where the lead or chase runners were as the whole entire course was now flooded with 750 runners all over the course running different paces, so I just focused on running my race. As I came in/out of Dam road a second time, Nick, Jamil, and Jimmy gave me encouraging decreasing splits on my proximity to the leader. Jimmy warned me not to get excited, and to reel in the fading leader gradually, but I was already in my race routine surging past the 60% mark. In my experience in competitive running, the most tactical time to make a move on a consistent course, is around 50-70% of the race distance. Runners in a 50 mile are past their immediate reserves, and are their most vulnerable to stronger runners as they are tired but still feel far from their finish. 70-80% is a good place to make a move too, but you also risk not recovering in time for the final push, or trying too hard to pass someone who has already recovered from the 40-60% low. Thus, I went ahead with my plan and surged passed the road runner at about mile 26. As I came up on him, he looked back, and asked if I was in the 50 mile. As I replied yes, he tripped over a root and rolled. I tried to offer consolace reminding him it was a long race and he had time to recover, but I don't know if he mentally appreciated it. Either way, I felt stronger knowing my competition was starting to bonk, and surged ahead to finish the loop in 4:09. Having taken in 3 Gu’s, 3 shot blocs, and two salt sticks in the last lap, I felt well fueled and ready for the last lap. Coming back out, for the 3rd loop, the 2nd place runner was only 2 minutes behind, and the rest of the chase pack was still mostly within 10-15 minutes. I knew, that I had to maintain the surge and fight the building fatigue. Though it would have been tactically and mentally easier to ease up and let my body fully recover for a 1-4 mile finishing sprint with a competitor I could see, I knew my race wasn’t just about winning, but about running a consistently challenging workout that would give me confidence for American River. I had wanted to go to the bathroom (#2) on lap two, but managed to do without. I was hesitant on eating more Gu on the second lap, and only had 1 Gu and an endurolyte in the first half. I knew I was slowing down, but kept trying to maintain a good pace to avoid any mental relaspse. As I came out of Dam Road (mile 42) for the last time, I had a Gu, but still felt hungry. I popped the 3 last shot blocs and waited for a burst. The hunger slightly subsided, but I still had to have another Gu coming out on the fire road for the last 6 miles. I quickly realized that I was running so hard that I was going to need more Gu to finish strong, but the 300 calories of Gu and Shot Blocs in the last 20 minutes seemed too much to handle. I held off eating any more Gu, but was hungry for the last 6 miles. Though I felt like I was running hard, I knew my actual speed was muted because of the hunger in my stomach. I added time over the last 10 miles because of not eating enough earlier on in the first lap. Caloric defeceits are non-negotiable, you either stop and chow down, or run hungry trying to absorb whatever you can. I chose the later and finished starving, but still running strong out of sheer mental determination. Though I do support finishing with nothing left, I believe that bottoming out phase should be in only the last 1-2 miles where adrenaline and testosterone provide the temporary energy for a sprint. Unfortunately for me, it was a 8 mile slugfest, and my time suffered because of it. One high point on the final aproach though was seeing Lori, my godmother from my first 100 miler, Rio del Lago. When I started my ultra career, I did my 50k, 50 mi, and 100 mi, all within one month of eachother, and to say the least, I made a lot of mistakes. At Rio del Lago, I had trouble with the heat, fueling, IT bands, and mental fortitude. In the middle of the race, she came up on my tail and helped talk me through my doubts. Whether it was my IT bands locking up my knees, my dehydration, blisters, or my will to finish, for all my doubts Lori patiently kept giving me reasons to keep going. She kept my head in it, and kept my race (and ultra career) alive. I saw her with 5 miles to go running the 100 mile race. I said “Lori! 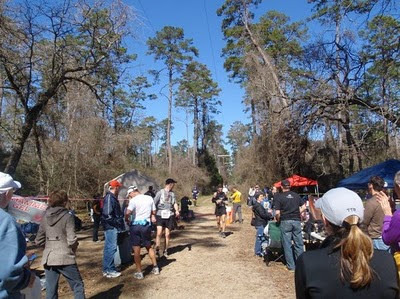 Rio del Lago 2008!” as I glided past her, and she shouted some enthusiasm back nearly pulling some tears out of me as I thought about how far I’d come since then, and how supportive the ultra community was. There’s apart of me that will always remember her, and remind me how lucky I am to know such supportive people in the sport, and in my life. Perhaps one of my favorite parts of the race was actually my shoes. Painful fueling mistakes aside, I really had fun with my MT 100's letting my feet move freely. 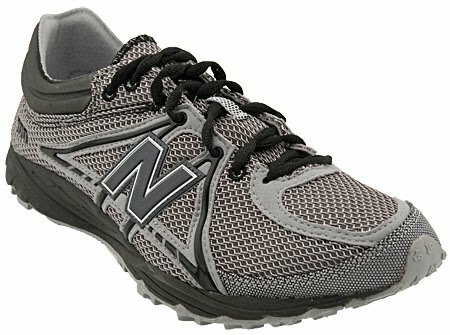 Make no mistake, this 7.8oz flat is all business as far as a minimalist trail racing shoe. It's engineered from top to bottom (and heel to toe) to be strictly utilitarian. No unnecessary stiff heal shank, dugout spheres under the midfoot for added downhill traction, soft sticky rubber for grip without huge nubs, a rock plate in the toe, light and durable SuperMesh that drains well, a small stiff lip on the toe, an extra wide toe box to avoid blisters, and a piece of cloth for the tongue. All this specific design makes the shoe an absolute pleasure to race in. The foot lands free and natural, with added nubs on the outside toebox and big toe (high wear areas), and feels almost surreal to allow the foot to run over rock and difficult terrain quickly and smoothly. For 50 miles, this shoe did everything I asked for, and more; delivering me to the finish line quickly and injury free. I love my MT's!!! I recovered well with plenty of protein and salt, and went on to pace KD for 11 hours from 1-11AM. There’s a lot of crazy stuff that happened, but I’ll explain that experience in another post maybe. Until then, it’s full speed ahead with the training till American River. I’m not 100% happy with my results from Rocky, but I’m glad that I have enough confidence to go into bigger races confident that I can hang with the big dogs as I perfect my fueling and training. However I am more convinced than ever that I can make it happen! you HAVE come so far, Dom... i'm so proud of you.